"When I was diagnosed, I told friends and family I was going to remain upbeat. I didn't want tears and sadness. It was hard for them to stick to it at first but they are getting used to it now. I was reluctant when the hospice was first suggested to me. I pictured going through the doors and not coming out, but it couldn't be further from the truth when I got there. Going to CaST (Creative and Support Therapies) gives me a sense of belonging, like I've been adopted into the family. There's a big age range, and we laugh and joke and take part in activities. I really enjoyed the talk on flower arranging! Having cancer, it's easier to speak to someone else who has it. They understand how you're feeling. We're comrades; one and all. I came into the hospice as an inpatient too as I was having terrible pain. Coming in was like the weight of the World being lifted from my shoulders. I was greeted by doctors, nurses and admin staff - everyone's focus was on getting me well. I was sent for radiotherapy while I was there and felt trepidation about going but I agreed because I trust the Doctors. The kitchen staff prepared packed lunches that day for me and my nephew in case we had a long wait. I went down a long corridor into a room that reminded me of Star Wars. It took minutes and it was done. When I came back to the hospice the staff knew what to do. The nurse greeted me and asked how I was. She listened to me, gave me the reassurance I needed and it felt like I'd come home. The doctor patted me on the back and asked how I was. For all the side effects of the therapy the hospice had some way of helping. I got pain relief, nausea tablets and cooling cream. Any issues or symptoms I ever have, they seem to be able to fix it. And when I was able to go home again, the hospice sorted out district nurses and the combined care I needed so I didn't need to worry about a thing. It was all taken care of. The hospice is full of wonderful people. They are thoroughly decent and professional. From the cleaners, canteen girls, doctors, nurses and volunteers, they're a good team. You couldn't buy the care you get at the hospice. I've experienced the amazing way you're looked after on inpatients and CaST and its priceless - I love them all to bits. It's time people woke up to know how good the hospice is and what it gives to the people of East Lancashire." Get involved! Take a look at our blog. 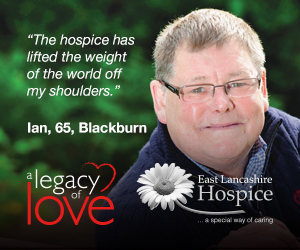 See Ian starring in the hospice's Legacy of Love Campaign.